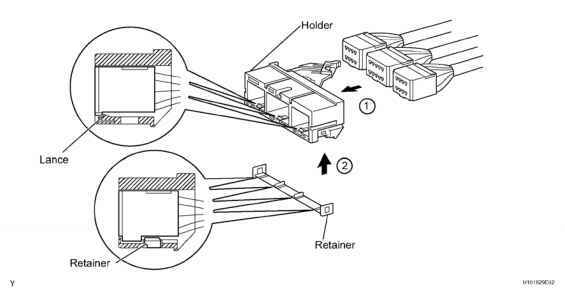 SRS connectors are located as shown in the following illustration. Fig. 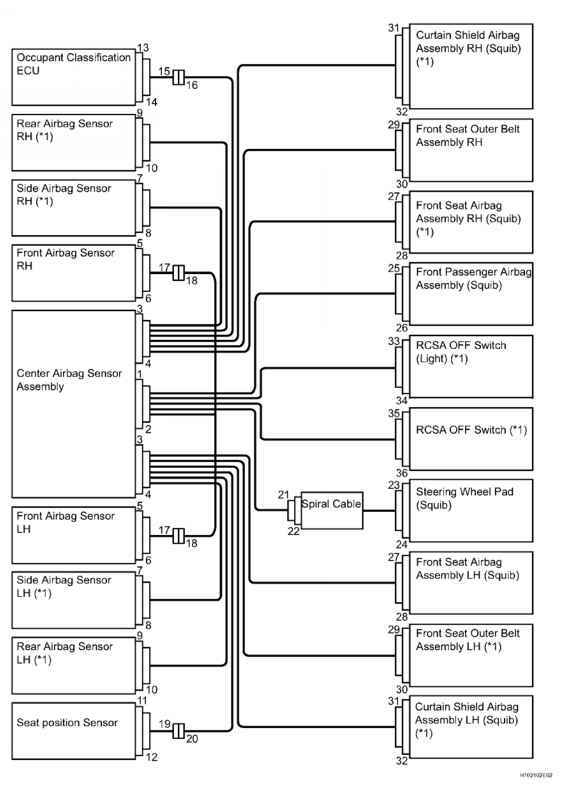 1: Supplemental Restraint System Communication Diagram Courtesy of TOYOTA MOTOR SALES, U.S.A., INC.
a. All connectors in the SRS, except the seat position sensor connector and occupant classification ECU connectors, are colored yellow to distinguish them from other connectors. 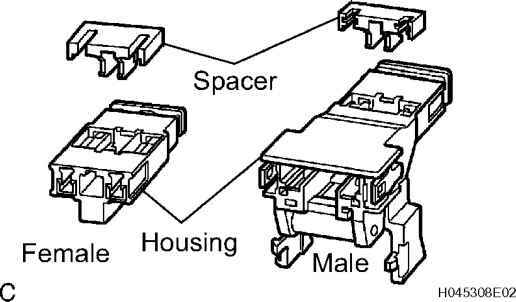 These connectors have special functions, and are specially designed for the SRS. All SRS connectors use durable gold-plated terminals, and are placed in the locations shown on the previous page to ensure high reliability. Each connector has a two-piece component consisting of a housing and a spacer. This design allows the terminal to be locked securely by two locking devices (the retainer and the lance) to prevent terminals from coming out. Fig. 2: Identifying Terminal Twin-Lock Mechanism Courtesy of TOYOTA MOTOR SALES, U.S.A., INC.
Each connector contains a short spring plate. 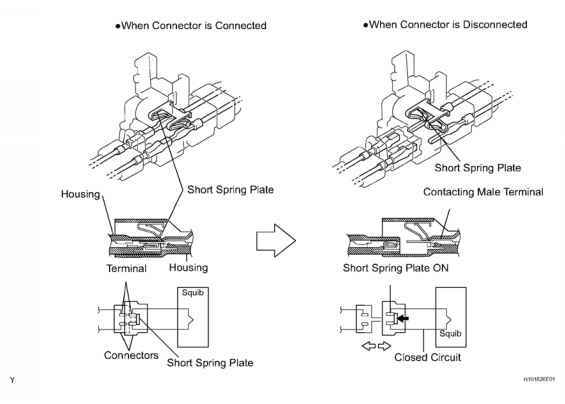 When the connector is disconnected, the short spring plate automatically connects the positive (+) terminal and negative (-) terminal of the squib. Fig. 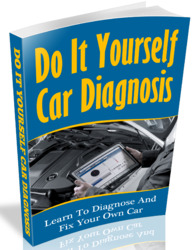 3: Identifying Activation Prevention Mechanism Courtesy of TOYOTA MOTOR SALES, U.S.A., INC. Fig. 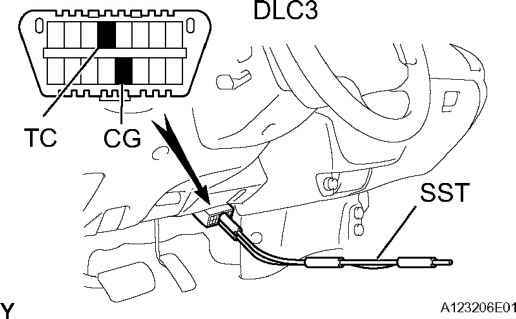 4: Identifying Half Connection Prevention Mechanism Courtesy of TOYOTA MOTOR SALES, U.S.A., INC.
Locking the connector lock button securely connects the connector. Fig. 5: Identifying Connector Lock Mechanism (1) Courtesy of TOYOTA MOTOR SALES, U.S.A., INC. Both the primary lock with holder lances and the secondary lock with retainer prevent the connectors from becoming disconnected. Fig. 6: Identifying Connector Lock Mechanism (2) Courtesy of TOYOTA MOTOR SALES, U.S.A., INC. 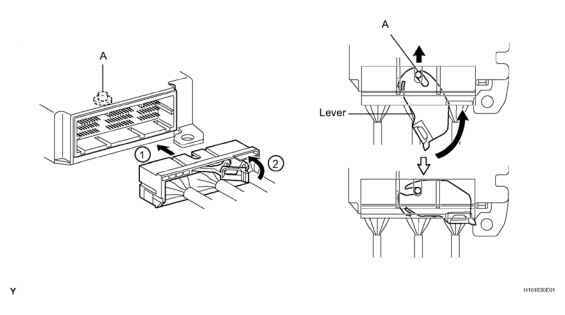 When connecting the holder, the lever is pushed into the end by rotating around the A axis to lock the holder securely. Fig. 7: Identifying Improper Connection Prevention Lock Mechanism Courtesy of TOYOTA MOTOR SALES, U.S.A., INC.